Harvard Theological Review has been a central forum for scholars of religion since its founding in 1908. 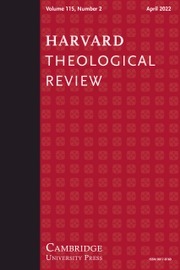 It continues to publish compelling original research that contributes to the development of scholarly understanding and interpretation in the history and philosophy of religious thought in all traditions and periods - including the areas of Judaic studies, Hebrew Bible, New Testament, Christianity, archaeology, comparative religious studies, theology and ethics. Judaic Texts and Their History?